Laura was a truly AMAZING woman whom I miss very much. She knew tragedy and loss at a very young age. Watching her home burn down with her cherished doll collection inside, having her hair caught in an old wringer washing machine, losing her husband and being left with 3 young children to raise before she was even 30 she could have easily taken the tranquilizers the doctor prescribed for her at that time and just give up on the world. Instead she continuously re-invented herself. She pretty much quit smoking and got her driver’s license after the age of 50. She outlived her long time fiancée and bravely continued on never seeing the need to find another man to take care of her. 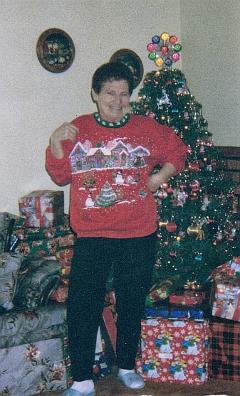 Every year she would dress up for Halloween to hand out goodies and loved Christmas and spending time with her family. She was a Bingo LOVER and became well known throughout the Northumberland County Bingo Halls for her many wins and colourful character. Everyone acquainted with her loved Laura! When she first became ill with a pinched sciatic nerve and was bed ridden for a little over 6 months she had to spend Christmas in bed while we all rallied around her. Shortly after she was back on her feet I did an Art from the Heart Adventure with her and was pleasantly surprised when she drew her tree as a bright red evergreen. She wanted to be remembered forever as a passionate, fun loving pioneer. Laura was soon diagnosed as having incurable lung cancer. While she had quit smoking herself all the second hand smoke at the Bingo Halls continued to do damage. Watching her go quickly downhill was painful yet she always made us laugh when we least wanted to. An example of this was when she fell down the 3 short steps from the dining room and living room. She landed upside down and couldn’t get up. Thankfully a friend was coming to take her for a doctor appointment. When Laura was upright again she said she had prayed NOT to die with her bum up in the air. God answered her prayer. Instead, when it was time she died peacefully in her hospital bed. At the estate sale we were both AMAZED and delighted to hear the majority of the attendees say, “I just wanted to have something of Laura’s as a keepsake.” She was indeed the red evergreen tree she had created. This generous lady still holds a special place in the hearts of many. Especially mine. She was my mother.